The lens has a focal length of 55-200 mm. 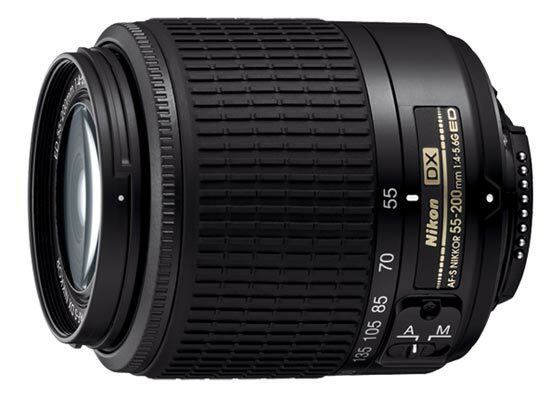 Since the lens is designed to be used on a camera with smaller sensor ('APS-C') the focal length will be equivalent to 82-300 mm on your Nikon camera. One thing to consider is that the lens has a variable brightness, which means that depending on how much you are zooming the lens will have a different maximum aperture value. At 55 mm the lens brightness is f/4 and at 200 mm the brightness is f/5,6. Through the link below you can read more about what this could mean for you as a photographer. If you buy this lens it will come with a lens hood, whose model name is "HB-34". Text from Nikon: "Silent Wave motor enables ultra-high-speed AF with exceptional accuracy, super-quiet operation. Focus mode switch enables quick switching between A (auto focus) and M (manual focus)."